Posted by Nina Rosenstand in Culture, Ethics, Nina Rosenstand's Posts. Some gift givers spend time and energy trying to find just the right gift. But thoughtful gifts don’t necessarily lead to greater appreciation, according to a study published in November in the Journal of Experimental Psychology: General. The benefit of a thoughtful gift actually accrues mainly to the giver, who derives a feeling of closeness to the other person, the study found. People are more appreciative when they receive a gift they have explicitly requested, according to a similar study published last year in a separate publication called the Journal of Experimental Social Psychology. Sharon Love once received a book that was clearly regifted: It was inscribed to the giver. She gave it back to him the following year. Ms. Love, who heads a marketing agency in New York, is herself a regifter when a gift is appropriate for another person. Oh, where to start? What a smorgasbord of philo-associations! Psychological egoism: They’ve said it all along, we give so we’ll feel good! BUT if the receiver doesn’t appreciate our gift, we won’t feel nearly as good, so we must have at least some interest in actually pleasing someone else. Aristotle’s Golden Mean: There are a thousand ways to miss the bull’s-eye, and only one right way to hit it. There is one right gift for our friend/mom/dad/spouse/child/colleague out there, and if we have an excellent character we will know what that is. Another study found spending more money on a gift doesn’t necessarily translate into greater appreciation. 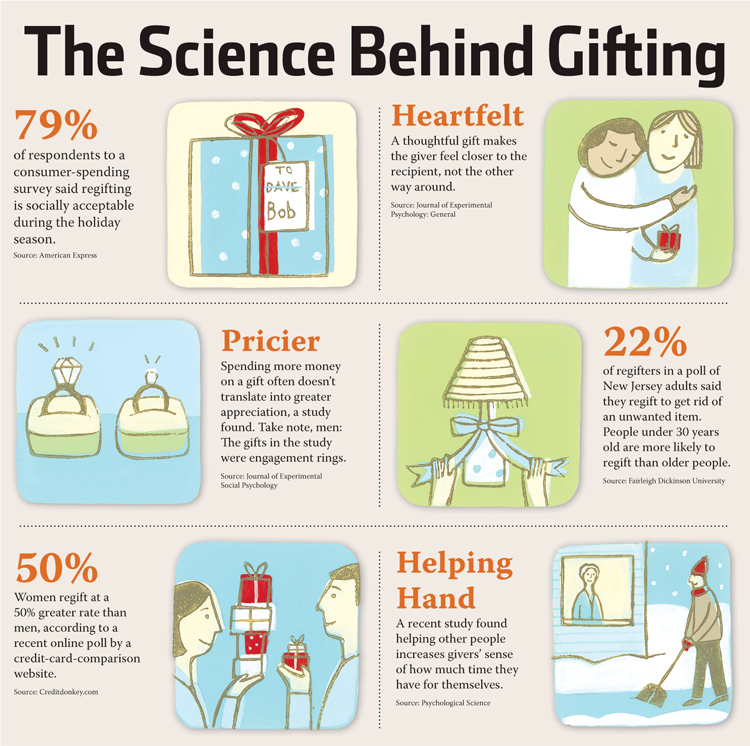 That might come as a surprise to many gift givers, who often assume that a more expensive gift conveys a higher level of thoughtfulness, according to the research, published in 2009 in the Journal of Experimental Social Psychology. I don’t mean to sound sanctimonious, but some of us grew up in a less materialistic world, and the idea of “the more expensive, the better” is somewhat alien to us. But there’s always the assumption that if someone is going to return our gift to the store, then it looks better if they can get another gift at the value of $50 than at $15…That’s just human nature. But again, what would Aristotle say? The Golden Mean is a mean between two extremes, too much and too little. For each situation there is an appropriate action/feeling (and purchase), and sometimes what your recipient really really wants is something small and simple. Sometimes it is huge and expensive, to be sure, but then Aristotle would say that you are guided by the Golden Mean of your ability to give, and fondness for/past history with the recipient. The adage “It’s the thought that counts” was largely debunked by the recent study in the Journal of Experimental Psychology: General, which concluded that gift givers are better off choosing gifts that receivers actually desire rather than spending a lot of time and energy shopping for what they perceive to be a thoughtful gift. The study found thoughtfulness doesn’t increase a recipient’s appreciation if the gift is a desirable one. In fact, thoughtfulness only seemed to count when a friend gives a gift that is disliked. And that brings me to my final branch of this discussion, on the tree of Virtue Ethics: the virtue of Gratitude. And this is where we switch from “descriptive” to “normative.” After all, we’re not doing psychology but philosophy here. So my response would be, Then start showing some gratitude for the thought, for goodness’ sake! Gratitude is not just a feeling, but an attitude (yes I know, it actually rhymes). You can show gratitude even if you don’t have that warm, overwheming feeling. If you wait for the feeling to arrive, somebody didn’t raise you right. So when you get that yucky somethingorother, regifted or not, then smile and say thank you, and if you can tell that somebody actually spent a lot of effort in getting that one thing to you, tell them it’s amazing how well they know you. And since I’m not a fan of regifting at all, since you risk offending a kind giver irreparably, then donate the gift that wasn’t perfect. Somebody out there in a thrift shop will thank you.